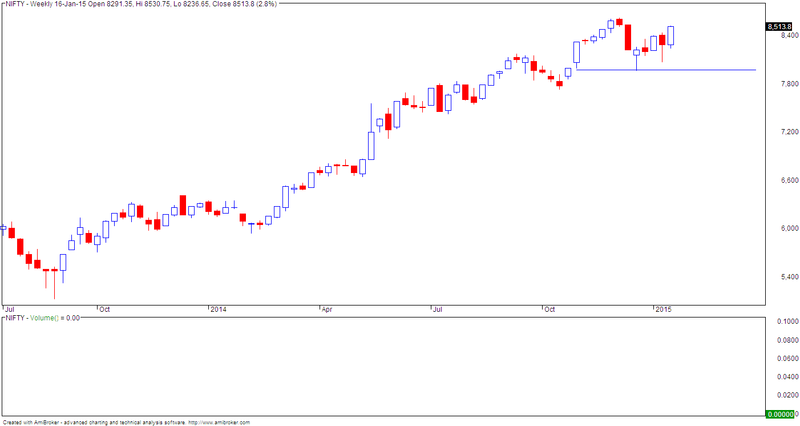 BNF posts biggest intraday drop in 6 months hinting at a possible trend reversal. Current swing low is at 19000 levels. 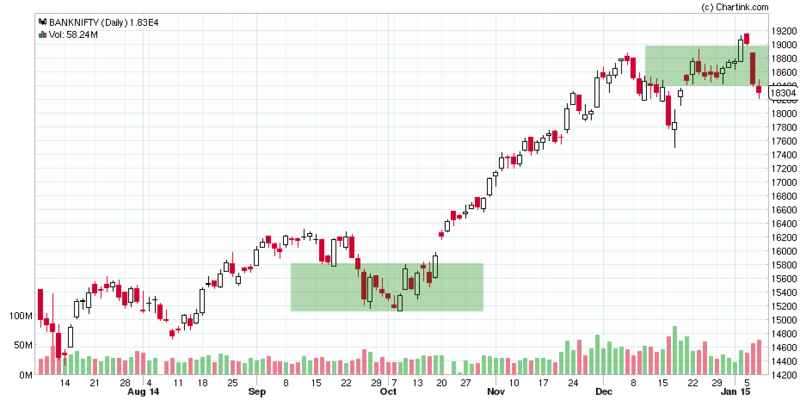 For confirmation of trend reversal, I will wait for formation of a higher swing low followed by a break of this level. This will take some time. Till this happens, I will assume trend is up with SL at 18500 spot. These are levels of support for the correction and NOT an indication that the levels will come. Note the cluster of supports between 8400 and 8600. 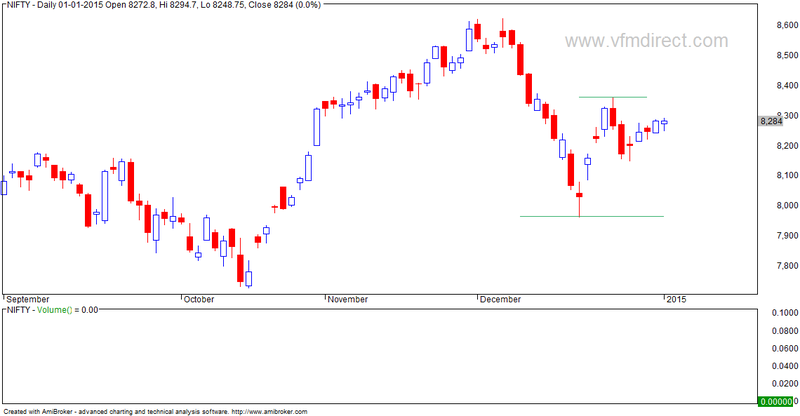 This will change marginally if one assume start of rally from DEC low at 7960. Trend is still up and will reverse on close below 8000. Incidentally FEB series option writing has substantial call writing at 9000 levels and put writing at 8000 levels. It’s Germany’s worst nightmare. Increasingly isolated, ganged up on, and even hated by much of southern Europe, it is fast losing the argument over the future of the euro. Even the Governor of the Bank of England, Mark Carney, has been at it. 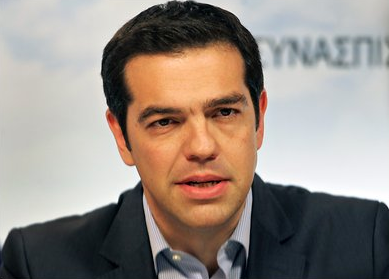 This week he joined in the German bashing with a full-frontal attack on Berlin’s austerity agenda. And it’s causing confusion, dismay and resentment in equal measure in this most stable, disciplined and civilised of nations. To understand the decisive shift in narrative that has taken place in Europe over the last couple of weeks – from the defeat Germany has suffered at the hands of the European Central Bank, to the Syriza victory in Greece and its demands for debt forgiveness – you have to go back to the euro’s origins and Germany’s place in it. Germans never wanted the single currency in the first place, for like Britain, they instinctively understood where it would lead – to a fiscal, or transfer, union which Germany, as Europe’s dominant economy, would be forced to bankroll. If given a referendum, they’d have said no. On daily charts, markets formed a large bearish engulfing bear - this happened at the resistance area outlined by the expanding triangle. Option writing clues have also been hinting at strong resistance at these levels. Has the trend changed? A one day fall does not mean anything and while today's drop was 1.6%, we had a bigger fall of 3% this year at the lower end of the expanding triangle. Of course, this is a warning sign. For a trend reversal, I will look for formation of a higher swing low followed by it's break. Current swing low is 8060 levels which is way too deep with nothing in between this level and 9000. Trend is up and will reverse on close below 36000. Note slower pace of the rally (bearish sign) and strong support at 34000 (limited downsides?). Note slower pace of the rally (bearish sign) and strong support at 25000 (limited downsides?). Markets close at new high while forming lower high lower low formation. This is the first day. Overall trend is still up even as markets are at strong resistance levels. 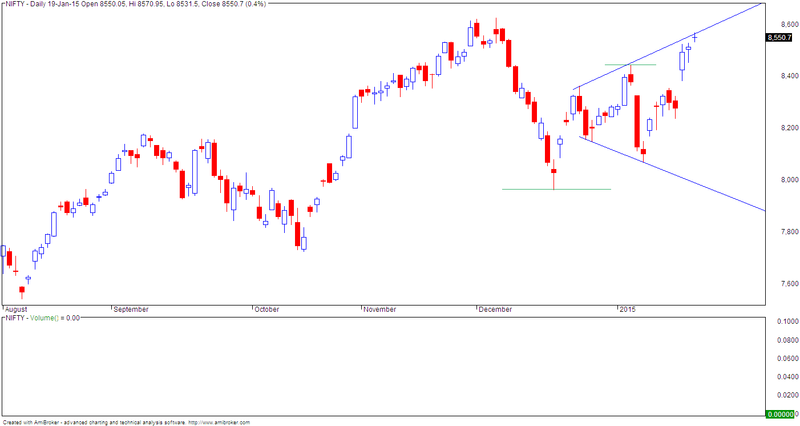 NIFTY trend is up; however it is now at upper end of the expanding triangle. Some reaction is likely here most likely to form a higher low. Also, a formation of 2-3 days lower high lower low will be considered normal. Option writing points to support at 8000 and resistance at 9000 (FEB series). Trend is up with trendline resistance at 9000 spot levels. Support exists at 8400 levels. Incidentally though markets closed strongly in the positive, advance decline was flat. Note that on Friday also, we had good closing but advance decline was negative. 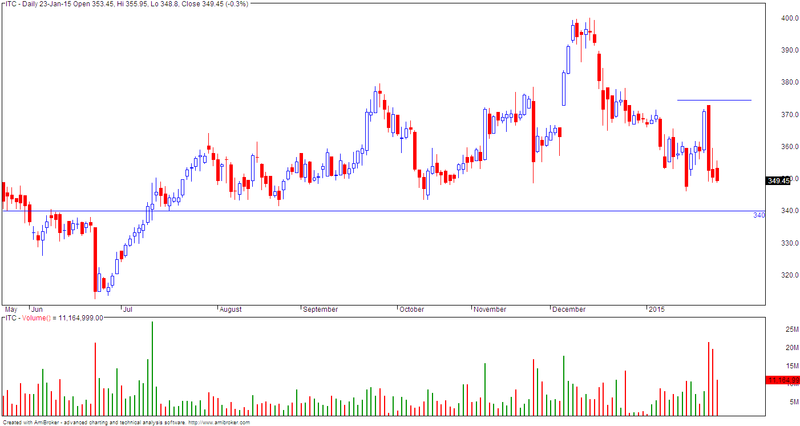 ITC nearing 6 month support - note that stock has not corrected or rallied in this period. Trend is still up with SL around 19000. Note swing low is around 18200-18300. I missed the last 1000-1200 points! On weekly charts, trend is clearly up with no signs of any reversal. This week's 4% move has also given a new lifetime high closing. Weekly close below 7970 spot will be first sign of trend reversal. 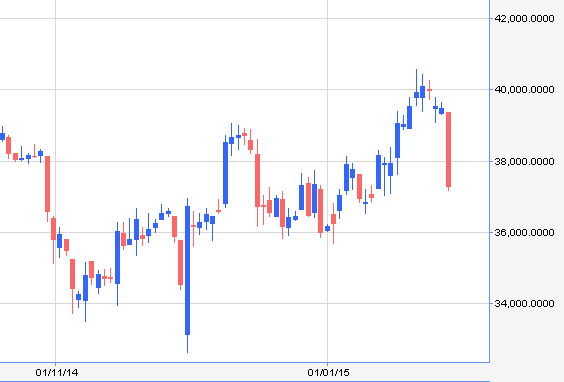 Fibonacci retracements show resistance at 9050 levels. Option writing points to strong resistance at 9000 levels (FEB series) and strong support at 8000 levels. This means writers are expecting a range expansion and that too on the downside. The only fault with this analysis is that we are close to expiry and the levels can get a bit unreliable. On daily charts, we have 3 consecutive gapups with small bodies... today, we also had the peculiar situation of a negative advance decline even as markets closed in positive. This is indicative of selling in broader market. Trend is up with reversal level at 8550 spot. Nearest possible target is 9000 levels +/- 100 points (based on Fib projections). This means a rally of another 100-200 points is possible. Trend is up with reversal level at 8380 spot. Nearest possible target is 9000 levels +/- 100 points (based on Fib projections). This means a rally of another 100-200 points is possible. Option writing points to strong resistance at 9000 levels (FEB series). Markets close 1.7% in positive and at a new lifetime high... advance decline was mildly positive. Trend is up with reversal level at 8380 spot.... I am also now discarding expanding triangle view. Trend is up with reversal level at 8380 spot. Note expanding triangle formation on EOD charts... this is the bearish option and will come into play if markets break crucial supports. Here target for correction would be 8000 or thereabouts. Incidentally we also had a gap up opening followed by a doji.. this has bearish implications if markets open gap down tomorrow. Daily charts: trend is up with SL at 26500... note strong resistance at 28000. There are 2 views here. 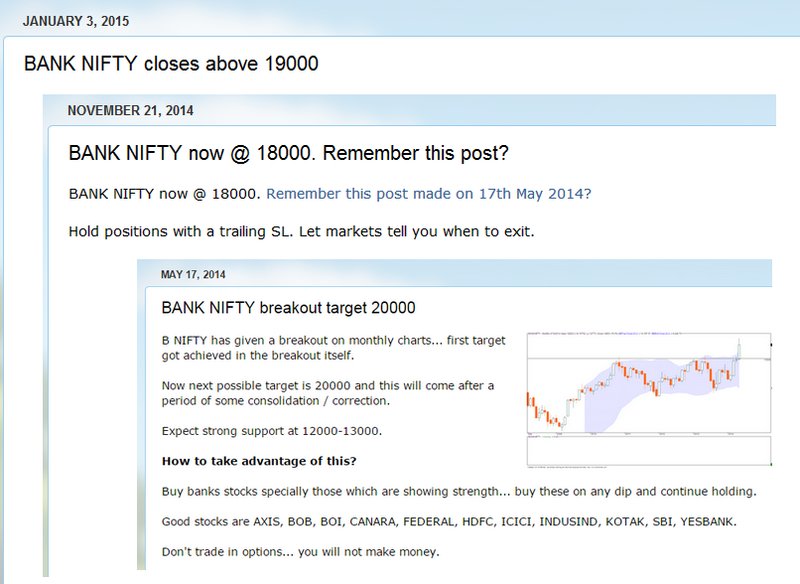 Bullish view - trend is up with strict SL below 19000 spot. More strength above 19400. 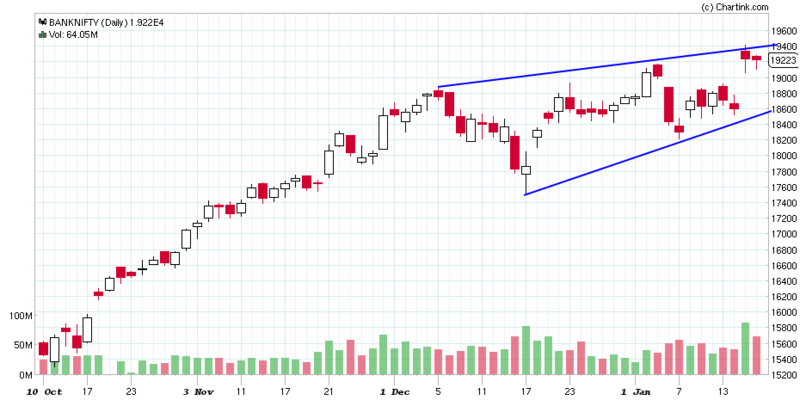 Bearish view - BNF is trading in a rising wedge defined by the trendlines. 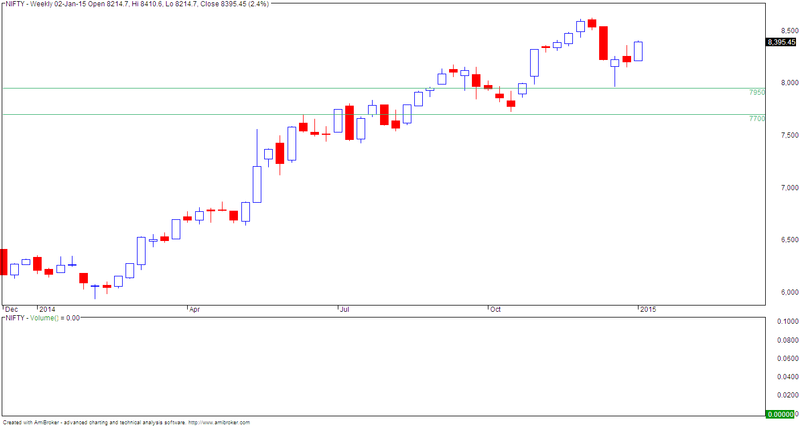 Sustaining above 19400 will invalidate this view; break below 19000 will lead to correction to 18600 levels. Break of lower trendline will lead to a correction to 17400 levels. 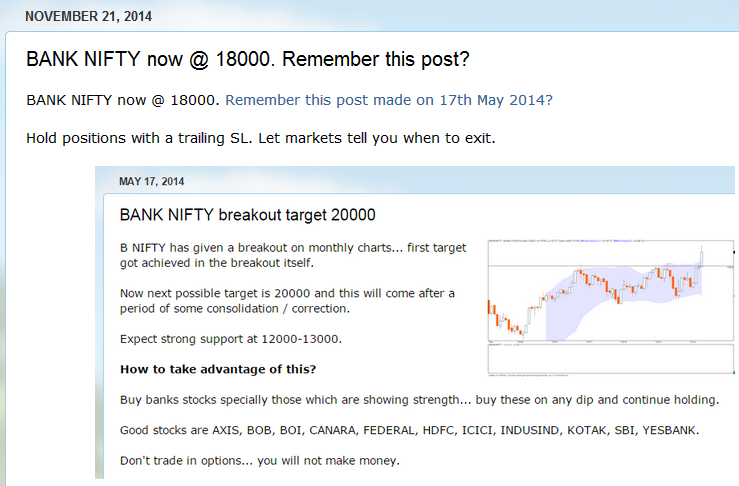 Summary - expect strength above 19400 and weakness below 19000. 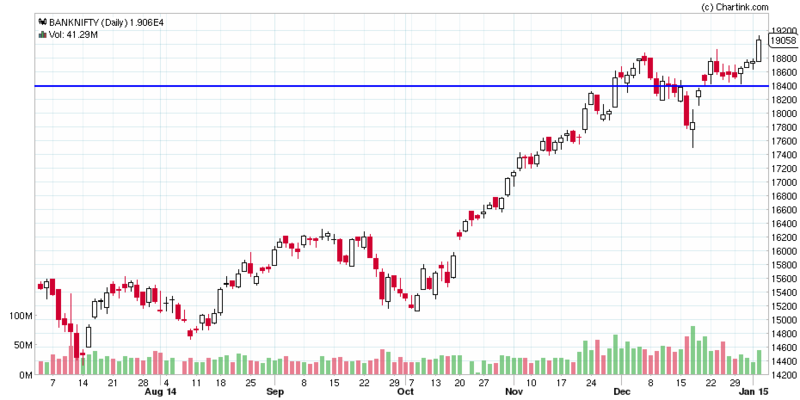 Note strong resistance at 8630 spot and slower pace of last 4 weeks rally. Markets open gapup and close 2.6% in positive. Advance decline was positive but nothing great. I am now discarding triangle view as markets closed above my invalidation level of 8450 spot. This means that (a) we are having a bullish breakout or (b) markets may trade in a horizontal pattern followed by a correction. It does not matter what happens if you have your stops in place. For a bullish move, I will look at a strict stop below today's low of 8380 spot. In other words, one should be worried only if markets close below this level say tomorrow. 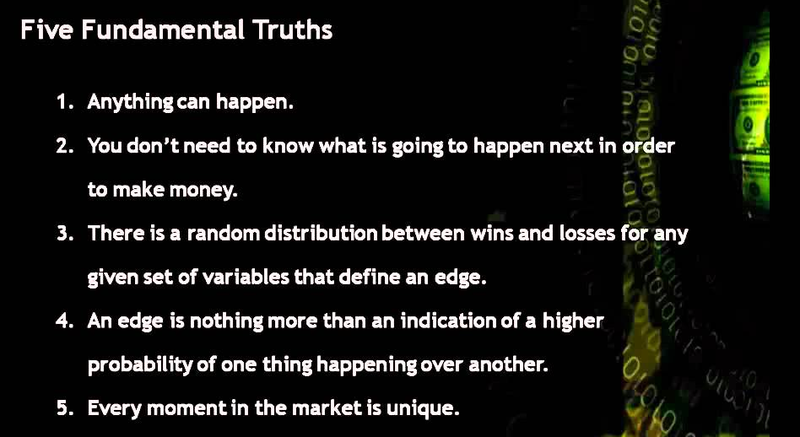 There is no reason to be short in the market unless you are a contra player and know what you are doing. 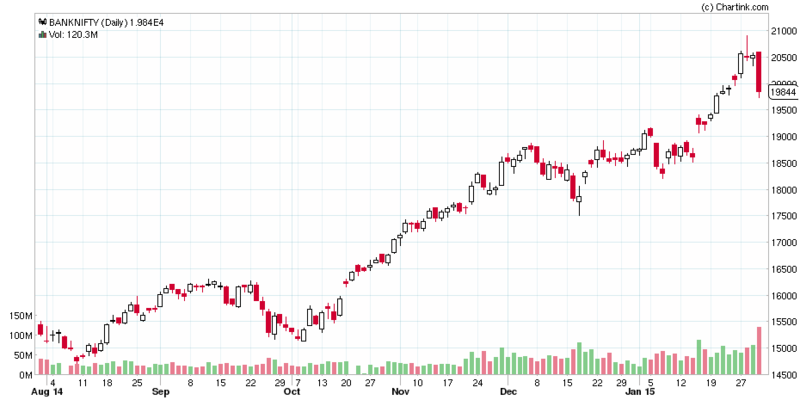 Markets finally form "lower high lower low" but this was after 4 days of "higher high higher low" pattern. Now to understand what is happening one should focus on the "tails" formed during this rally... each such event is indicative of selling so you have to be cautious and not jump into long trades. At a higher level, I am expecting a triangle formation with each leg tracing out an ABC pattern. For the current leg, I have drawn expected pattern and c leg (of the bigger C shown in thick blue) is expected to open down. Slower retracement in place even as markets form "higher high higher low" for 4th consecutive day. Note today's close was within the range of yesterday's bar. The broader view is continuation of rangebound trading for some more time. Form this perspective, this still remains a day trader's market. Today markets closed in positive and formed "higher high higher low" for 3rd consecutive day. Since markets are trading in a triangle, it will be difficult to anticipate size of each move. 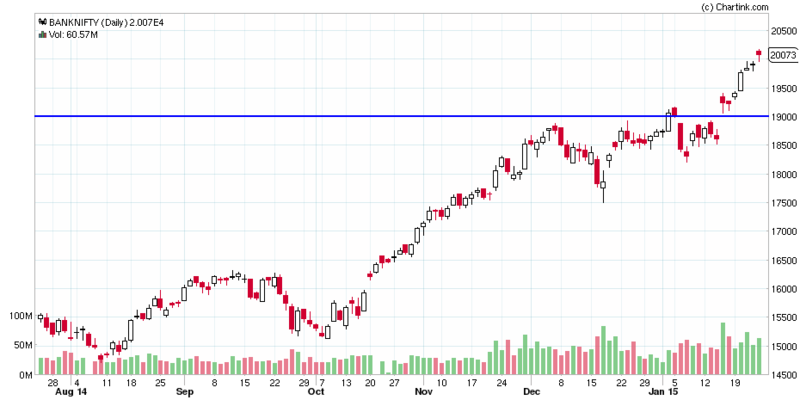 At this point, suffice to know 8450 spot will be our buy above level on daily charts (on hourly charts, you would be long quite some time ago). Option writing points to support at 8000 levels. I have generally found FB to a waste notwithstanding the ability to "connect" with old friends and colleagues. However my "going social" meant wasting more time doing things which I never was doing earlier. Posting silly pictures, clicking on likes and so on. If someone wants to "connect" with me they can always google me and get my contact details anyway. 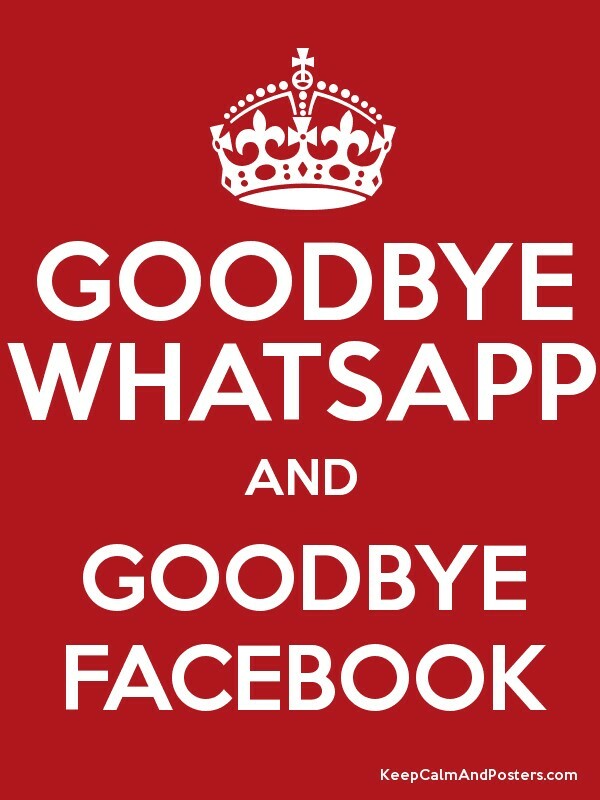 I am completely off Whatsapp for similar reasons. While I found it excellent for fast chats, the group features made this a complete mess. There is only a certain amount of messages you can handle and the vast majority was silly jokes, good mornings and what not. The funny thing was not only did I end up wasting my own time, I also started wasting other people's time. I am still on Twitter... so far this is not a time waster as I do not "follow" anyone. But then let's see how long. We have a bullish candle but this does not mean anything much because (a) the previous fall did not get fully retraced and (b) current rally looks to be corrective in nature. Nevertheless, the previous trend is up and so far it is not negated so we have no choice to be bullish on weekly charts with reversal level at 7950 spot. Markets form 2nd day of "higher high higher low" formation. This is normal within a downtrend. Note that though markets closed in the positive, advance decline was negative. Markets are most probably tracing out a 5 wave corrective with each corrective internally divided as a ABC move. 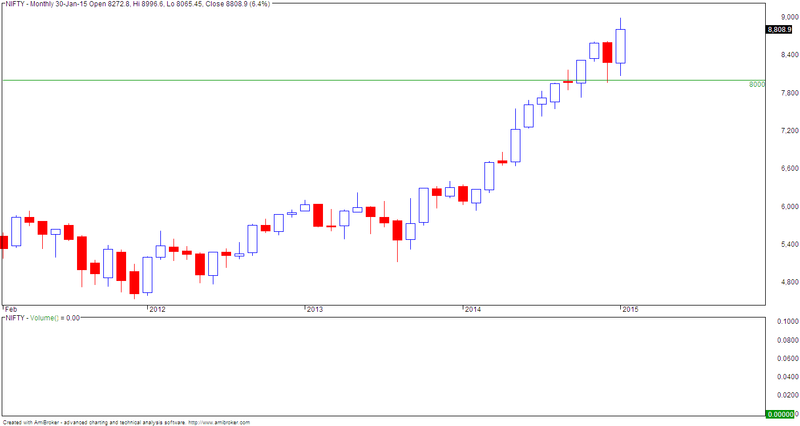 This means we can some big moves this month without the nifty achieving anything. Clearly a day trader's market. This means current upmove should stall soon followed by down wave retesting 8000 levels. 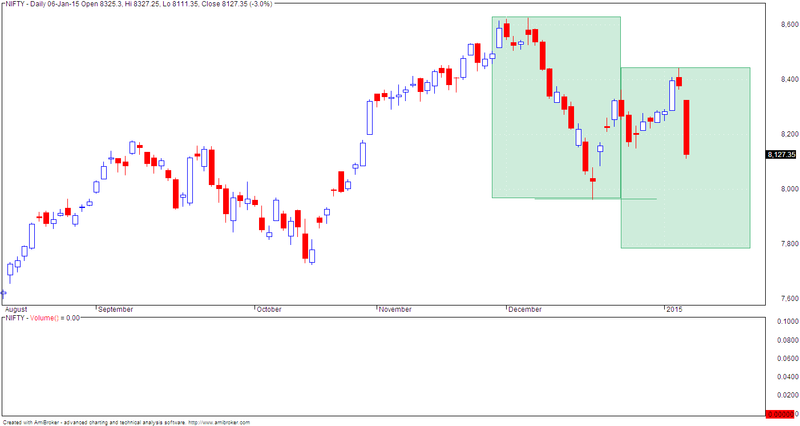 Last buy has whipsawed... this was along expected lines as was indicated for the nifty. Note that chart depicts expected direction... the levels or number of days will not match. Basically I am expecting a triangle of 4-5 legs where each leg takes an a-b-c leg. Further each leg will be smaller than previous leg so what we are looking at is a contracting triangle. Broader market is tracing out a triangle between 7960 and 8450 spot. So expect a small bounce before another drop to 8000 or below. Note that I am expecting any move to form a ABC pattern (ignore this statement if you are not comfortable with Elliot waves). If we assume the fall in DEC was the "a" leg, then the "b" got over last week and "c" wave has started today. 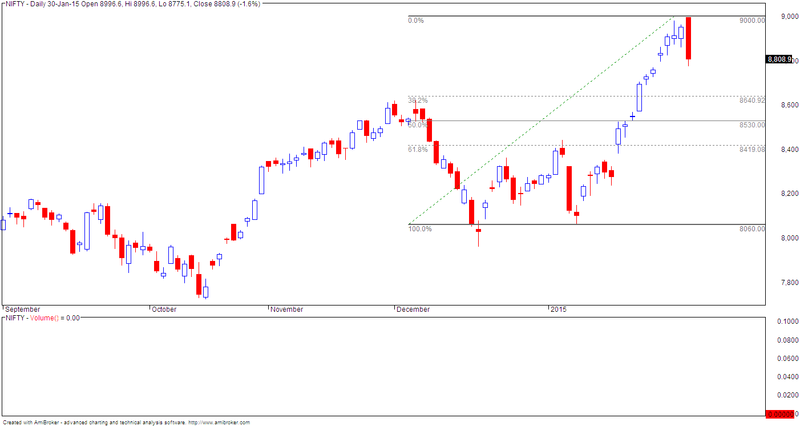 If this view is correct, then "c" should atleast equal "a" wave... meaning that min target is 7800. This will also mean 8000 has to be break - looks difficult given the fact that highest open interest is at this strike price - let us see how this support holds. Fib projection at 1.618 times is at 7400 levels. Yesterday it was mentioned that ".... possible triangle formation between 7900 and 8600 leading to a lot of whipsaws. This means that there is a good chance that current buy signal can fail." Today the market closed below the previous minor swing low and stopped out the long trade. Now critical levels will be considered at 7960 (support) and 8450 (resistance). The triangle formation continues so expect a lot of wild swings within this range. Option writing points to support at 8000... note that despite today's 3% fall, this has not changed. Trend is up and will reverse on close below 8150 spot. Note possible triangle formation between 7900 and 8600 leading to a lot of whipsaws. This means that there is a good chance that current buy signal can fail. Do not be obsessed with the levels... my purpose in this post is to show possible market direction. 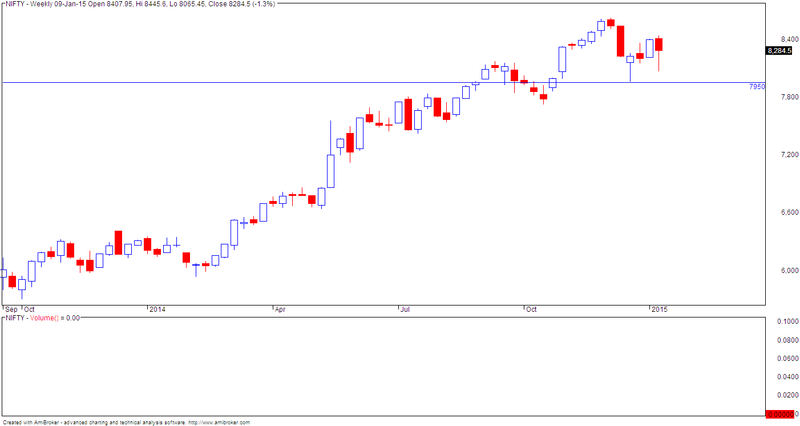 Trend is still even as BNF closes at lifetime high. SL 18400... deep support 17400. CNX IT index closes above minor swing high at 11300. 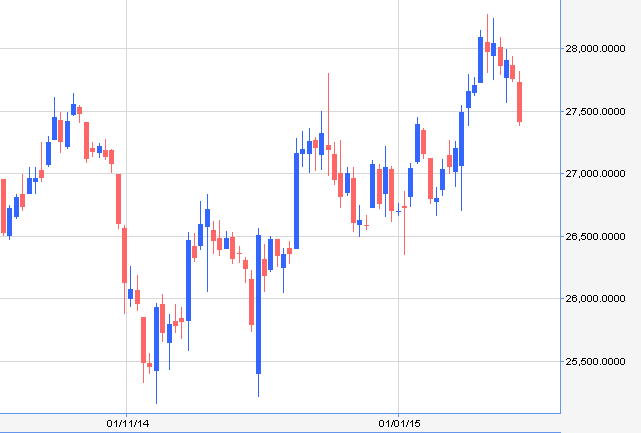 Consider trend as up with reversal level at 10900. 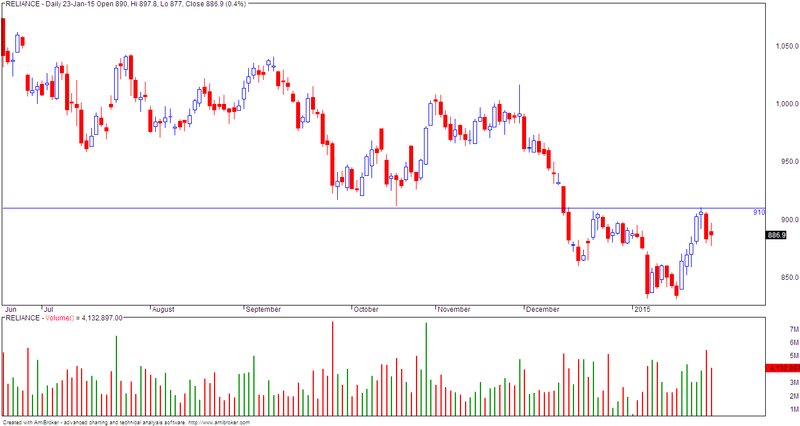 Watch for very strong support at 10600. 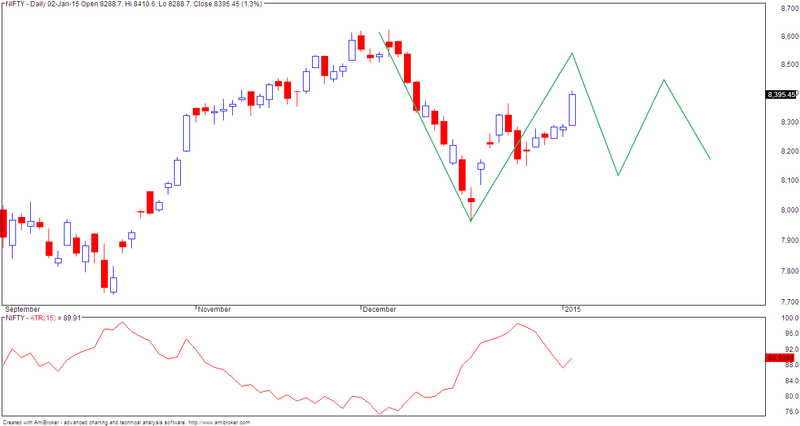 Earlier I posted (for many days) that trend is down till nifty closes above 8630 spot. 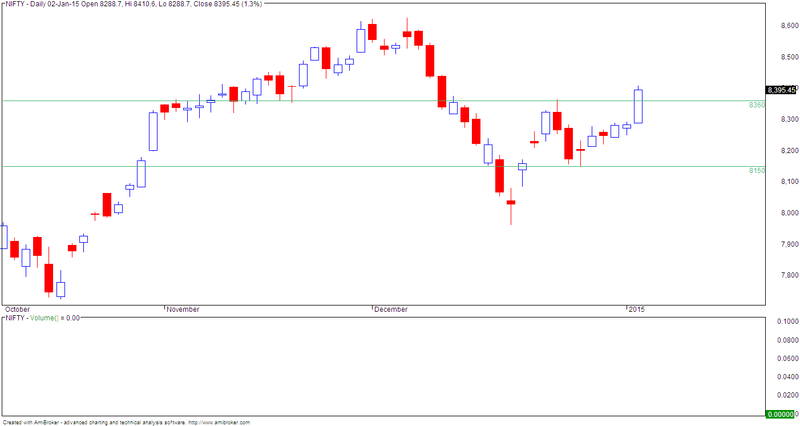 Today nifty closed above 8360 spot... now the way the charts look, I feel this level would qualify as a swing high. The new swing low is now 8150 spot. Note that these levels are very close so do not be surprised if there are whipsaws to this long trade. Look at the current situation as if your shorts are stopped out (at a marginal profit). 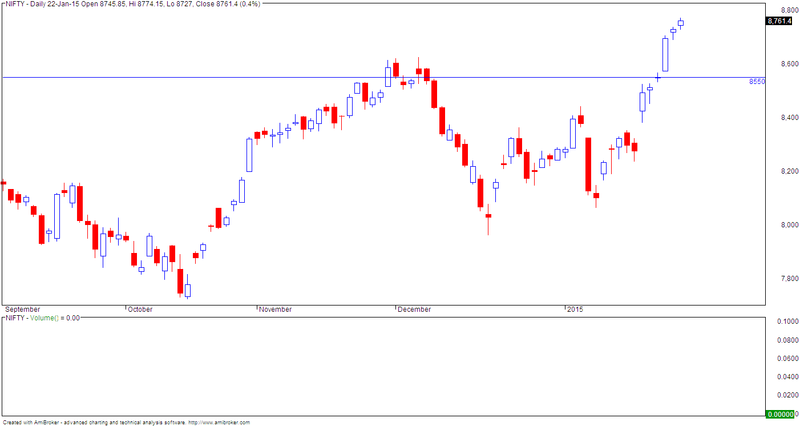 Close below 8280 spot will be first sign of weakness. Starting this week, I will no longer post "weekend update". 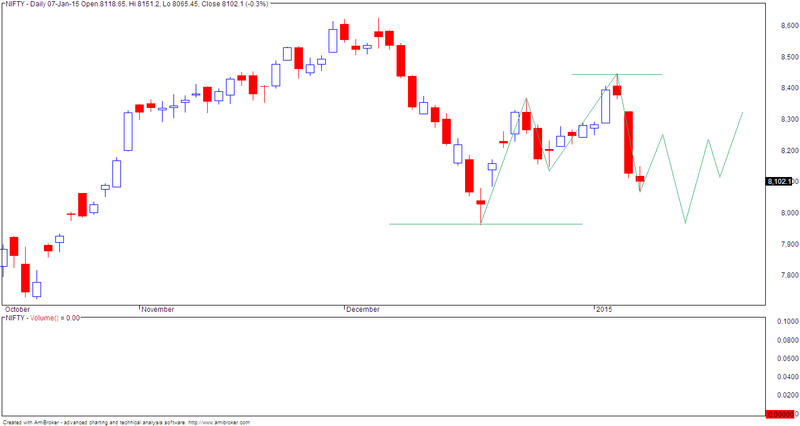 Instead I will simply post the weekly chart of nifty every Friday and write my comments. I am anyway following this notation for monthly and yearly charts. The primary benefit is that it helps me focus solely on the price action while ignoring the Y axis. So here is the weekly chart... trend is clearly still up unless we form a lower swing high. As you can see, this is the second week of higher high higher low formation. I have also shifted the swing low from 7700 to 7950 spot... this should come in handy if we have a sudden reversal on weekly charts. In other words, consider trend as up as long as market strade above 7950 spot. The recent corrective rally has so failed to cross 61.8% retracement level. 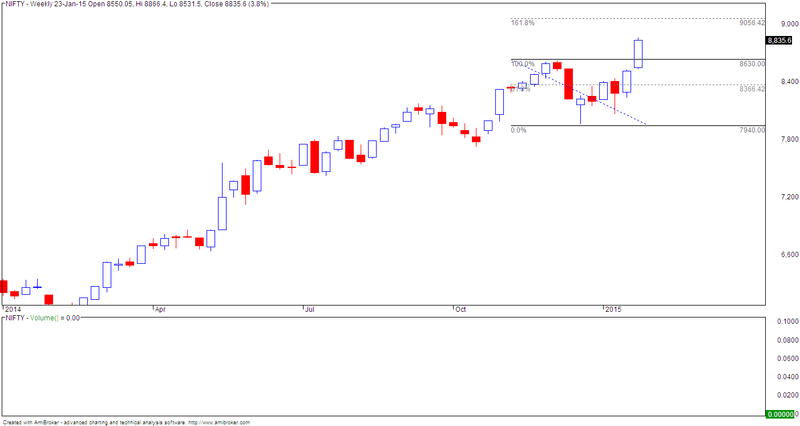 Now we have formation of swing low at 7960 and swing high at 8365 levels (all spot). Since markets are almost at halfway levels and considering that both support and resistance are nearby, it might make sense not to do anything unless you are a daytrader .... writing this from 4-5 days and so far nothing is happening - only broker earning. 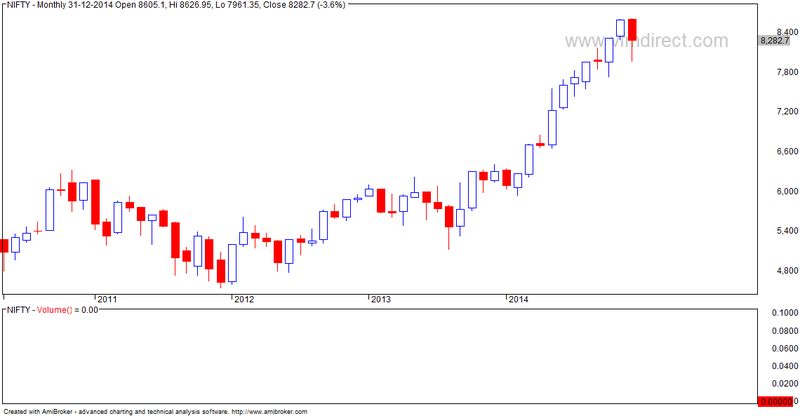 Super breakout on yearly charts... level of 6000 to provide excellent support. 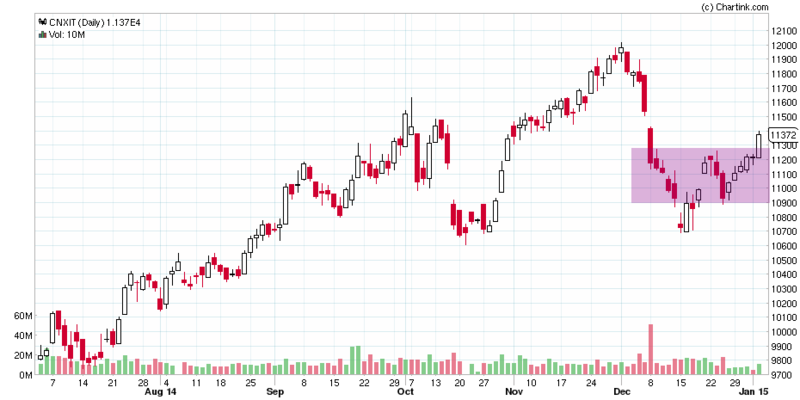 This is still a buy on dips market if you know where your SL is on yearly charts. 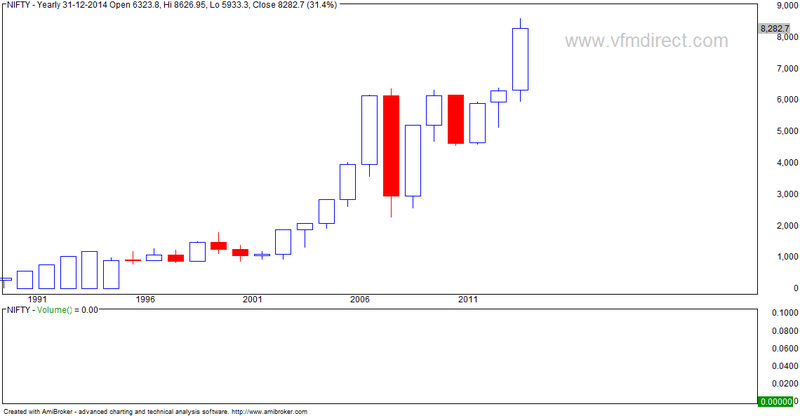 Long term target (5 years +) is 25000-30000 for the nifty (5 times breakout level of 6000). 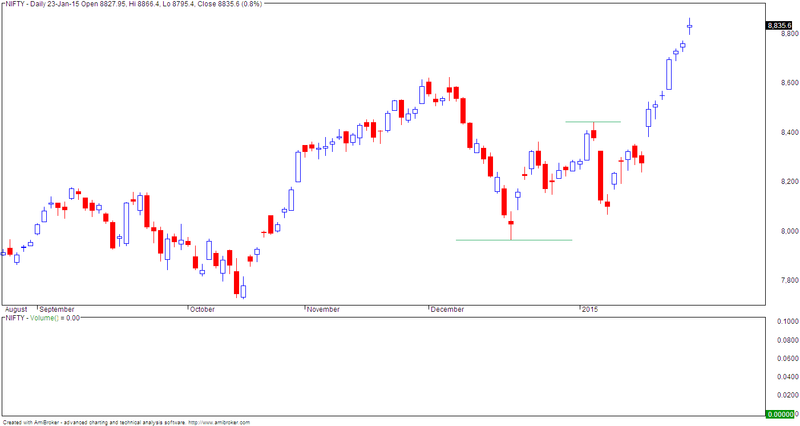 NIFTY forms a large candlestick with significantly lower low. DEC low (7960 spot) very important, looking forward. Expect start of a bigger correction if this level breaks.